Edited by Christopher R. Snell . “It is an ill wind that blows nobody any good” would seem an apt epitaph for recent events surrounding Chronic Fatigue Syndrome (CFS) and the retrovirus XMRV. 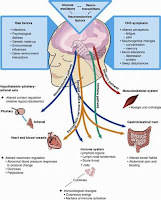 Despite the general failure to find support for a link between XMRV and CFS pathophysiology, the controversy served to shine a spotlight on CFS that may ultimately benefit the many patients around the world suffering from this poorly understood and most devastating illness. As advanced biomedical research techniques are increasingly applied to the study of CFS, it is surely only a matter of time before biomarkers are identified, etiologies understood, and remedies devised. The goal of this book is to provide scientists, physicians, and other interested parties, access to current thinking and research findings on CFS from around the world. To this end there are five chapters originating from four different countries and three continents. They focus on topics ranging from a discussion of possible links between CFS and viral infections to the role of cardiovascular dysfunction in CFS symptoms. There are also three chapters devoted to gene research and the potential for finding a genetic origin for CFS. Chapter 1, “Chronic Fatigue Syndrome and Viral Infections”, begins with a brief history of viral research and the link between viruses and disease. It goes on to discuss the many viruses that have been implicated in CFS pathology and relevant research findings. In the absence of any definitive conclusions regarding a viral etiology for CFS, the authors hypothesize a “hit and run” effect whereby viruses trigger an illness and then disappear or that CFS is neither caused by a virus, nor an infectious disease. They do observe that should a viral cause for CFS be identified, this would greatly improve the chances of finding effective treatments for the disease. Chapter 2, “Gene Expression in Chronic Fatigue Syndrome”, presents a review of current research on gene expression and the multisystem pathophysiology of CFS. Difficulties in treating CFS are ascribed to the high-variability of genetic anomalies observed in persons with CFS. Among the most consistent findings are changes in immune-related genes. However, it is not clear whether these changes are cause or effect, highlighting the need for further study. It is recommended that future research focus on the identification of those changes in gene expression that can explain the disease profile in CFS. Chapter 3, “Integrated Analysis of Gene Expression and Genotype Variation Data for Chronic Fatigue Syndrome”, describes how by integrating genotype variation data and gene expression data, it is possible to identify potential genetic causal mechanisms in CFS. Research employing the described integrated statistical model (ISM) is presented to show how genetic pathways identified using this approach may be implicated in some CFS symptoms. The application of this integrated, two-step approach to the analysis of any heterogeneous data sets is also discussed as are potential dangers inherent to oversimplification of the causal model used for complex diseases such as CFS. Chapter 4, “Corticosteroid-Binding Globulin Gene Mutations and Chronic Fatigue/Pain Syndromes: An Overview of Current Evidence”. In addition to its role in the transport of cortisol, corticosteroid-binding globulin (CBG) may have an even broader role in the neurobehavioral response to stress. Data from both genetic epidemiological research and animal studies is presented to show links between CBG gene polymorphisms and risk for chronic fatigue and/or pain syndromes. Because this association is not universal, an interaction between phenotype and other genetic or environmental factors is proposed with further study necessary to identify the mechanisms whereby CBG may influence the stress response. Chapter 5, “Small Heart as a Constitutive Factor Predisposing to Chronic Fatigue Syndrome”, suggests a cardiac dysfunction hypothesis to explain symptoms of CFS and a common co-morbidity, orthostatic intolerance (OI). Low cardiac output due to a small left ventricular (LV) chamber, characteristic of small heart syndrome, is proposed as a contributory factor in the development of CFS. The symptoms found in persons diagnosed with small heart syndrome are shown to be very similar to those of CFS. Studies showing evidence of small heart in persons with CFS and OI are also discussed. Possible treatments aimed at improving cardiac output in this CFS subgroup are suggested along with advice on avoiding triggers that may lead to reductions in stroke volume. While the chapters in this book are a long way from solving the enigma that is CFS, they do represent important attempts to understand this complex and perplexing disease. A common theme in them all is CFS as a multisystem disease with the possibility of more than one cause and influenced by a variety of interacting factors. They also represent what is a most welcome advance in the approach to CFS research. Theirs is a straightforward application of scientific principles and techniques toward the advancement of knowledge with the implicit recognition that this is a disease of biological origins. Further, they acknowledge the reality of CFS for persons with this disease and the importance of finding causes, treatments and ultimately a cure.